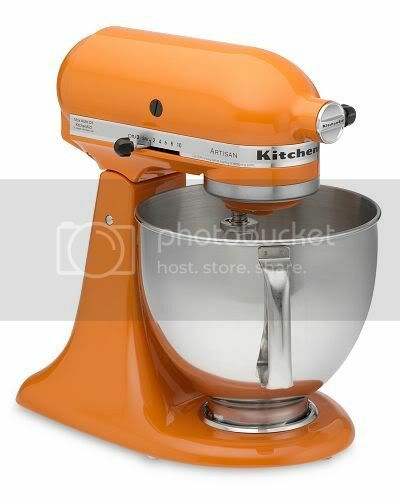 Big question I am now contemplating - which stand mixer to get i.e. the ultra cool Kitchen Aid or the durable and reliable Kenwood? We have an ancient Kenwood Chef stand mixer which has served us well but I think I blew the motor recently making a cake. Now I'm searching for a replacement stand mixer. My dream of course has been to buy the Kitchen Aid since it looks snazzy plus it's the preferred choice of chefs like Nigella Lawson. What worries me is when I compare the specifications between the Kenwood Major and Kenwood Chef series, they seem to be more superior than the Kitchen Aid Artisan models since it's got higher motor speed and bigger bowl size. The Kenwood is also significantly cheaper since it's probably made within Asia while Kitchen Aid mixers are imported in from the USA. Any thoughts on this? Let me know as I search for an answer. It's Donna Day time again and it's all about chequerboard cookies as proposed by Clare from eat stuff. My first time making these cookies and they were interesting to play with especially since I had lots of time last weekend when Splashie Boy was away. I went a bit "mad scientist" with my creations as I experimented with so many types - only four made the cut below while two failed miserably i.e. the green tea/pistachio and chocolate/orange versions. It's not easy handling the dough of this cookie probably because of our tropical weather so I had to cool them in the fridge for almost every step. I also found out one home truth about myself - despite all my mathematics and science background, I cannot get my cookie dough to measure equally at each corner hence my cookies are slightly off key. However, I won't trade none of my non-perfect cookies as they all taste unique. 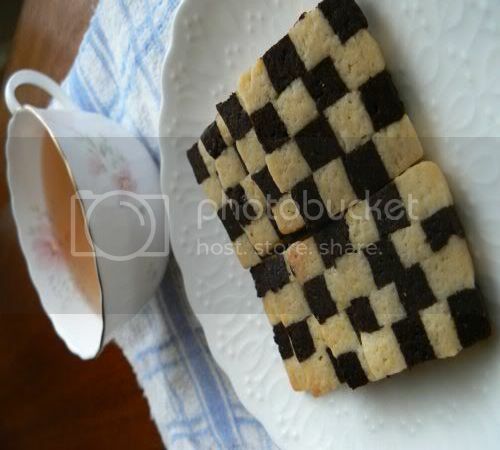 This Chocolate Chequerboard Cookie was baked from the exact recipe Clare gave on her blog. The only difference here is I made the squares smaller which were so fiddly hence you see some non- aligned squares. The extra effort paid off as they make a lovely pattern. I liked the chocolate version as you could smell the chocolate from these cookies making it really aromatic. I was toying with the idea of adding crushed Sichuan peppercorns in the dough but decided to keep it simple since I may have problems cutting the dough later on. Incidentally I used a method which I found from the Kitchen Capers forum to handle the dough with freezer bags and fridging it every step of the way to keep it manageable. 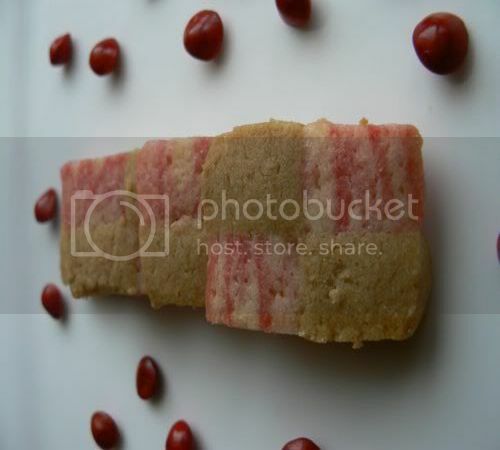 My second creation is the Peanut Butter Strawberry Chequerboard Cookies. Inspired by the ever popular combination of peanut butter and strawberry jelly or jam, I tried to recreate them in this cookie. I used a quarter of the original portion of the dough, divided into two and added about three to four tablespoons of creamy peanut butter into it. I kneaded the dough until the peanut butter was mixed in thoroughly. For the second portion of the dough, I added 1 tablespoon of strawberry emulco, a kind of strawberry paste or flavouring you get at the bake shops here. It would have been nice to add strawberry jam but I decided it may be too risky since I had no idea the impact on the dough's consistency. On the colour scheme, I thought a marblelized effect or a strawberry ripple will be nice hence I did not knead the dough thoroughly so it had steaks of the strawberry in it. After baking it, I realised the addition of peanut butter changed the texture of the dough as it was extremely fragile and crumbly. The flavour for the strawberry portion was not too strong either but somehow the combination of both of them were excellent especially the peanut butter which I loved. I got Splashie Boy to test taste them and we both agree this is the best version. Next version was a tribute to the Malaysian flavours I love so much: coconut and pandan. This time round, to make the pandan version, I had to rely on artificial pandan flavouring as the natural juice extracted from pandan leaves just don't smell strong enough. A bit of green colour was also added to the dough. Portion wise, a quarter of the dough was used and then one teaspoon of flavouring was added while the colouring was added slowly and kneaded till the green colour was mixed in thoroughly. I found if the dough gets too wet, add a bit of flour in it. The other part of the dough had about three tablespoons of dessicated coconut which I kneaded in. Tastewise, this was both our second favourite cookie as we liked the coconuty flavours. I would have liked a less artificial taste to the pandan portion but it worked out to be pretty good. 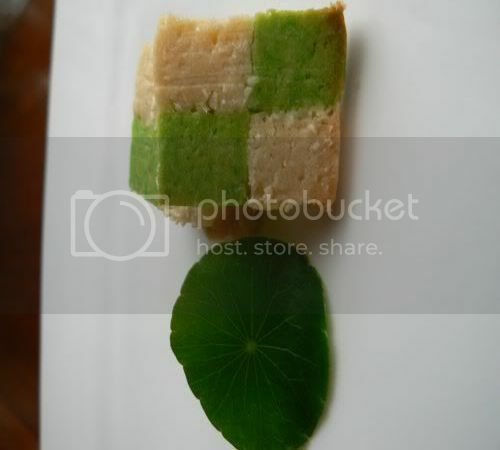 The green colour also makes it an excellent Hari Raya cookie too as it kinda looked like a ketupat from afar. My last version was the Earl Grey Tea and Lemon Chequerboard Cookie inspired by Martha Stewart's Holiday Cookies where she had Earl Grey Tea Cookies. I added a lemon portion as usually these flavours work well together (remember that quiz Sir Leigh Teabing gave Robert Langdon in the flick, Da Vinci Code before they entered his mansion). Maybe my Earl Grey Tea was not strong enough but the bergamot oil flavour was quite subdued. However I could taste the lemony part quite well even though it's quite subtle. For my Earl Grey Tea portion, I added two teaspoons of ground earl grey tea leaves while the lemon portion had one teaspoon of lemon juice plus one lemon's grated rind. Besides these versions, I had failures with my green tea/pistachio and chocolate orange. The green tea powder I used was too mild hence there was not much taste. Then I also found out it's not a great idea to add nuts to the dough as it messes up your squares especially when you try to cut them. The chocolate orange sounded like a great idea too but somehow the chocolate I used was not great while the orange portion I made just totally overpowered it. Thanks to Clare for suggesting these cookies, I had lots of fun playing with the dough, squares and rulers plus concocting the different flavours. If you haven't tried making them, do give it a try but remember if you're in Malaysia, keep fridging or else the dough will be too soft to handle. 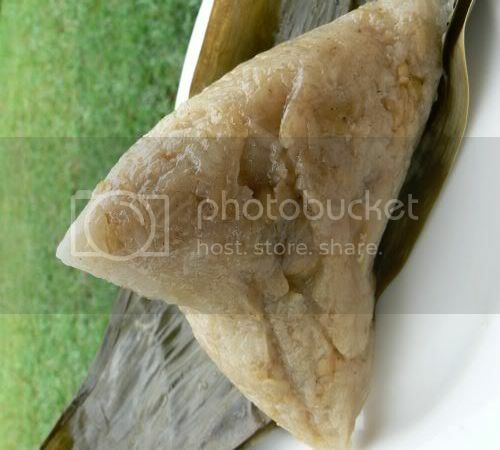 It's the Dumpling festival today which the Chinese celebrate by making pyramid shaped glutinous rice dumplings (Chong in Cantonese or commonly also known as bak chang) wrapped in lotus leaves for their family and friends. It's also known as the dragon boat festival with the ever popular dragon boat races. This year seems to be a quiet affair probably because of the controversy regards the shortage of meat to make the dumplings. Last year, I covered the festival extensively with step by step pictures on how to make them. This year, I thought it's nice to focus instead on how to celebrate the festival especially after reading yesterday's Star Metro article on the significance of the dumplings to a little village at the outskirts of Kuala Lumpur. Every year my aunt will make her batch of dumplings and distribute it among us which we love as they're excellent. We also get another batch from my dad's old friend who has them specially made for him that is equally good. As the best things in life should be shared or else it's no fun, I pass down the favour by sharing these dumplings among friends. So today, do remember to have some dumplings and share the delicious food with your family and friends as that's the fun and significance of this festival. 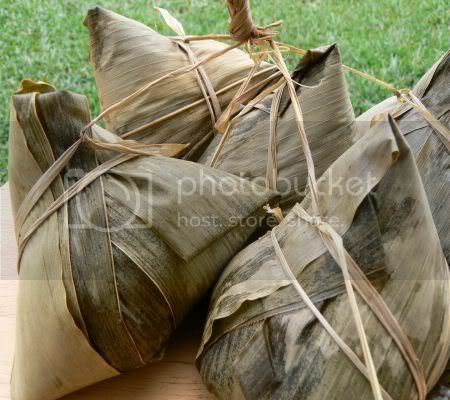 Malaysia Best for the history on the dragon boat festival plus pictures of the plain glutinous rice dumplings (Kan Shui Chong in Cantonese). She also has pictures of this year's Dragon Boat Race in Penang. Egullet's forummers has lots of information on the festival including how to make them and their experiences. Last Sunday was one of the rare occasions I managed to eat a late breakfast with my mother since Splashie Boy was out of town. 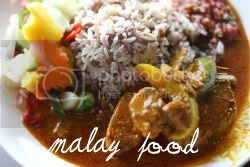 We headed towards the coffee shop, Yong Len at Taman Tun Dr Ismail for her current favourite "makan" i.e. 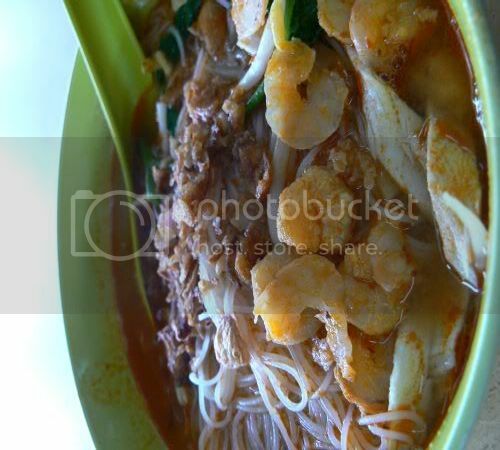 their prawn mee. The prawn mee(RM4.30 with extra ingredients) is excellent here and I find the soup broth is sweeter versus the ones they serve at Lim Mee Yoke. There's lots of great food at this coffee shop, their char kuey teow is not too bad and full of fat and crunchy bean sprouts. There is also a pretty good curry laksa at one of the stalls which I had earlier blogged about. Besides the hawker items, we also love their char siu pau (RM1.10). Although it's the run of the mill kind you get in a tall steamer in front of the restaurant, their paus are from a brand called Onn Onn which is excellent. You can get them at selected coffeeshops but for us, we usually get them at this place. 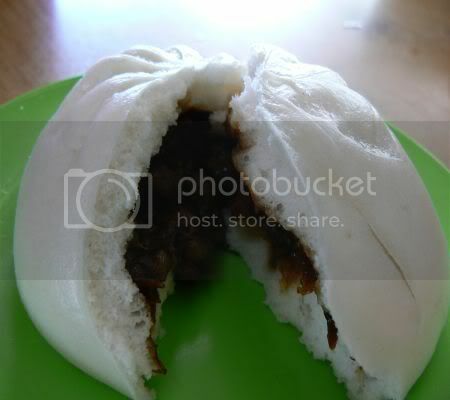 They also have a vegetarian pau filled with grated sengkuang which is not too bad. In front of the shop, there is a stall which sells Nyonya cakes. A must have here are their ang koos i.e. 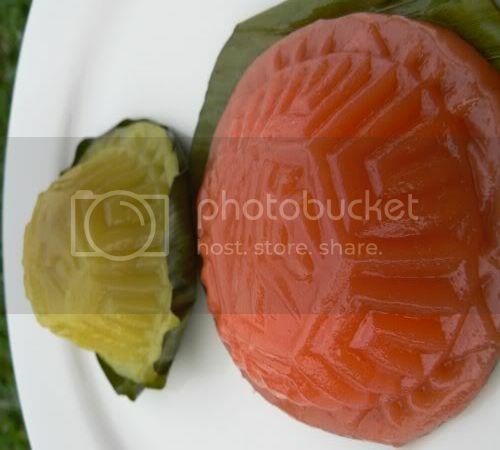 sticky red tinted rice cakes filled with green beans. 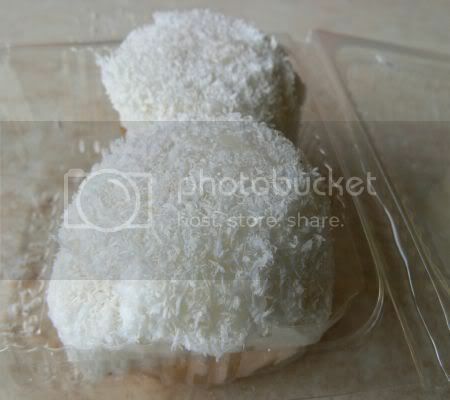 The green version on top is filled with grated coconut that is not as good as the traditional red ones. It's been ages since I ate at an Esquire Kitchen but the food is still fantastic. This place has been around for years and years, I still remember their first outlet was in Asia Jaya which was the premier shopping centre during the 1970s. They serve Shanghainese and Szechuan dishes but I prefer their Szechuan items. In fact they were one of the first places that served Siu Loong Pau. However I won't recommend them to you as it's not fantastic unlike the bigger ones you can now get in Shanghainese restaurants. Since it was just the two of us, we ordered their signature dish, the stir fried chicken paprika or what we know commonly as Szechuan chicken(RM14++). Excellent as always as it came coated in a yummy and sticky sauce, cashew nuts and diced chickens plus lots of dried chillies for fire. We were using the buns to wipe the yummy sauce. Instead of eating the dishes with rice, we opted to accompany it with their flower buns (4 for RM3.20++) which is unique to the restaurant. 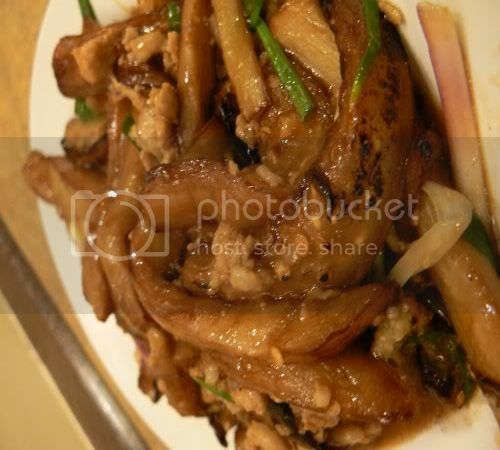 Usually you eat the Tung Po meat dish with the buns but we tend to avoid that dish as it's really full of fat! We ordered a fried meehoon for one person(RM6.20++) which I took blurry pictures of as I was in such a hurry. I was really taking pictures quickly plus sneakily as I spied someone I knew in the other table. By the way, it was my first time trying out the fried meehoon and it was excellent plus so much nicer than the ones you get in the Hokkien Noodles stalls. 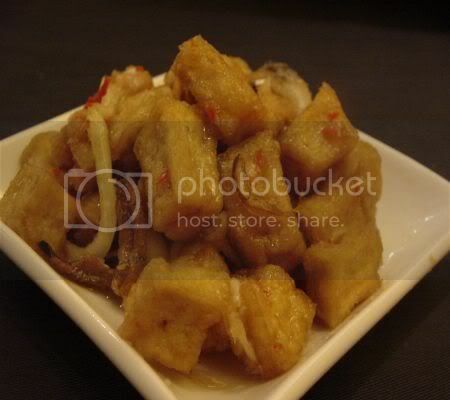 Another must have - their Szechuan stir fried eggplant(RM11++). They deep fry the eggplant or what we commonly know as brinjal which makes it so aromatic. They were serving bak chang too since it will be Dumpling festival soon. If you have room for dessert, try their Tau Foo Fah. They also serve tong yuen with black sesame seed filling. However if you don't want the traditional items, pop in next door to Alexis Bistro for a slice of cake. We were contemplating dropping by there to eat the Chocolate Moist but decided against it that day as the cake looked like it was left over since there was only 3 slices left on the plate. Fluff Puff is one amazing kitten! Not sure why but she's really a greedy gal and if you're eating anything aromatic, she will rush up to you and mew for some. 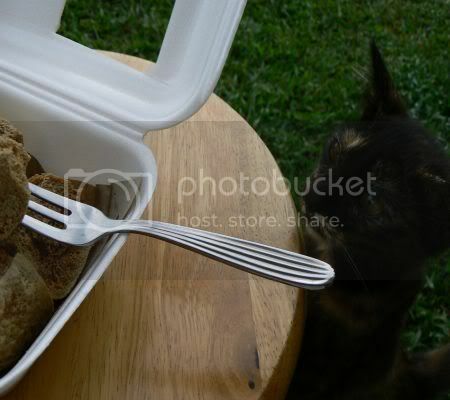 I find it amazing as my other cats prefer to stick to their cat food. I dare not feed her all the time (she even asks for spicy food!) but I did discover that she absolutely loves cake. So far she has eaten butter cake, sugee cake and this weekend, she discovered the joys of an orange madeline specially brought back from France. You crumble the cake/madeline and she goes mad for it, hoovering it up quickly like a high powered vacuum cleaner. Oh well, I guess she is trying to tell me that it's time I buy a madeline tray to bake her some since it's impossible to get any nice ones here in Kuala Lumpur. Head over to eat stuff for a guest kitty picture (the gorgeous Rudy) plus an announcement on WCB's first birthday celebrations. If you know me well, you'll know I am absolutely crazy about cookbooks. I have so many books and magazines that I have specially asked my contractor to add lots and lots of shelves in the new kitchen for them. I can never resist local cookbooks probably because I can't understand them since I am Mandarin illiterate but I still buy them especially those poorly translated ones. My most recent addition to my library is Famous Cuisine's Hawker Style Noodles Collection so you'll probably see me eating more noodles. The Famous Cuisine publications have a pretty good selection of cookbooks plus their bi-monthly magazine. These noodles looked pretty easy to recreate at home especially since I had a packet of Yee Meen in my larder. I changed some of the ingredients to suit whatever I had i.e. prawns instead of chicken, spring onions versus chives and omitted the mushrooms which I did not have. Surprisingly for such a simple dish, it was nice and tasty. If you want it spicy, accompany it with your favourite chilli sauce. Soak the yee meen in water for a while to soften. Remove, drain well and keep aside. Beat the eggs and shallow fry them until they are cooked. Remove and shred. Set aside. 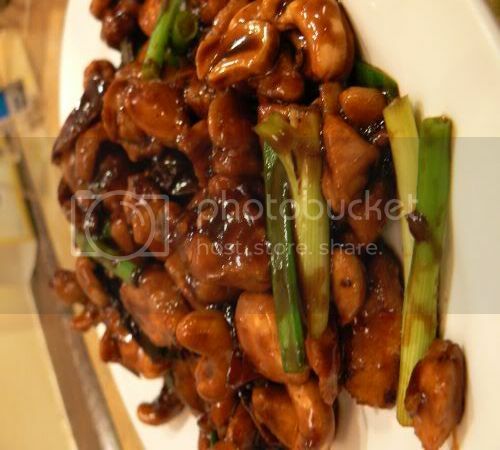 Heat up two tablespoons of oil in a wok and stir fry the shredded chicken and mushrooms until cooked. Add the yee meen, remaining ingredients and seasoning. Stir constantly on high heat until the seasoning is absorbed and the noodles are aromatic. Dish up and top with shredded egg or mix it in. 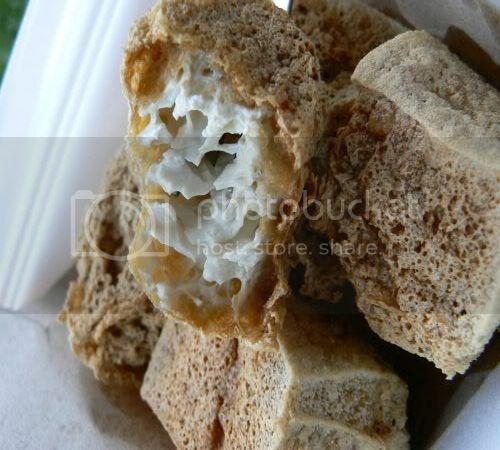 I have always been curious about stinky tofu or what we term in Cantonese, Chou Taufu after hearing about this snack from the Hong Kong television serials I follow. Finally had the opportunity to try it for the first time at the Cheras pasar malam (Malay for night market). It's not hard to find this particular stall as all you need to do is follow the stink. People don't seem to mind the smell as there was a small queue waiting patiently while they fried up the tofu. 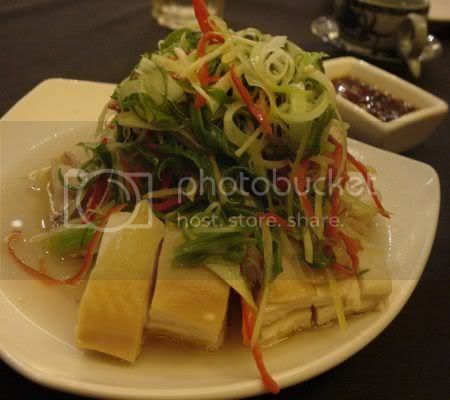 The tofu is cut into small square pieces and deep fried in hot oil. Once it's brown and crispy it's ladled out to be served. As they fry it batch by batch using a normal sized wok, there will always be a queue waiting for the tofu to be ready. The outside is extremely crispy while the inside is holey and spongy. It's strange as the tofu looks fine when it's cut up i.e. no holes but the brine which they soak it in has micro-organisms which causes fermentation. Tastewise it's nice because of it's crispy exterior and not as stinky as it smells. You eat it with lots of chilli sauce and cabbage pickles that they give you or else there's no taste. Pricewise, it's 4 cubes for RM2.40. It's definitely an acquired taste and not for the faint hearted as the stink can be extremely overwhelming. 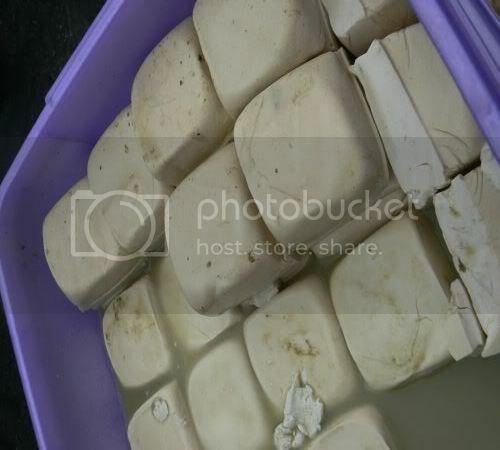 The tofu is packed in these plastic containers which contain brine made from fermented vegetables and shrimp. The brine is said to take approximately six months to make to allow proper fermentation while the tofu is soaked in the brine for six hours. See how the tofu is even getting a bit of mould from soaking in the brine. Incidentally if you intend to pack them home, beware as the smell follows you around until everyone knows you bought the stinky tofu. Hence it's appropriate that even the stall has the tagline, "aroma across thousand miles". Fluff Puff, the ever greedy kitten sniffed the tofu and also declared it off limits when I offered her a bit. The stall can also be found at Kepong Baru's pasar malam (Sunday), Sri Petaling's pasar malam (Tuesday), OUG pasar malam (Thursday) and Taman Putra Cheras pasar malam (Friday). Once in a while, I crave for some greasy goodness. Although I have my usual favourites when it comes to eating Char Kuey Teow, I wanted to try out this particular one after reading about it at Babe in the City - KL's blog. You can't really miss this place as it's a corner shoplot which faces Radius International Hotel on Tingkat Tung Shin but is actually located on Jalan Rembia, one of the small roads off the main road. The shoplot is devoted to the char kuey teow stall which also sells popiah. 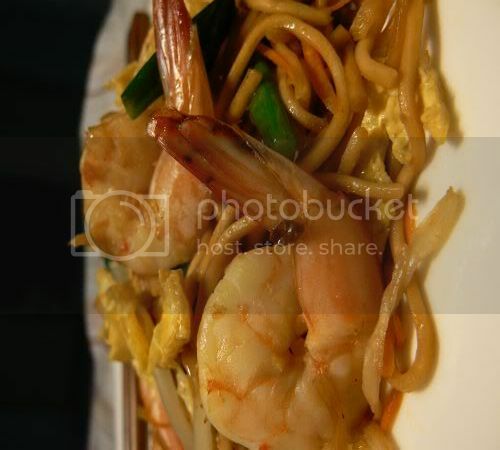 The place is run by a husband and wife team who both have their own individual woks to fry up your request. Was it good? I thought it was above average but felt that it still did not hit the right spot for me as it didn't have the "wok hei" flavour I liked. Not sure why it didn't have that since there wasn't that many customers when I ordered my char kuey teow. Sometimes certain char kuey teow sellers don't have the time to fry it nicely especially during peak times hence quality is compromised. 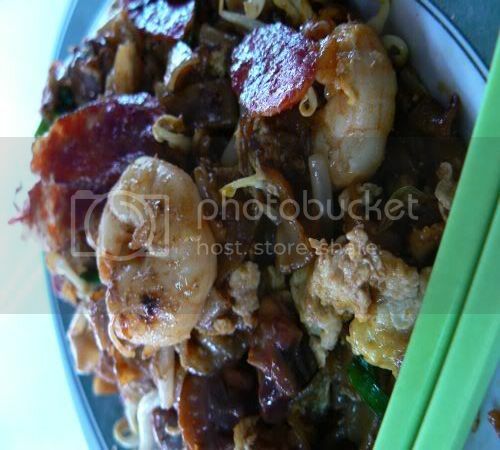 Although the char kuey teow here is a bit more greasy than what I like, I did like their cockles which were extremely fresh. Another gripe I have about this place was they did not serve any kopi-o to get rid of the greasy aftertaste but seemed to favour longan (or lor han kor) and barley for drinks. After reading Sweesan from Just Heavenly's write up about her recent visit to Fong Lye, I remembered I had some pictures of the place taken with the old camera. They ain't too brilliant as the old camera didn't used to perform well under low light conditions. Desa Sri Hartamas is a place packed with restaurants at every square inch but only two places are perpetually full all the time. One is the ever popular Souled Out and the other place is Fong Lye, a Taiwanese restaurant. If one is planning to eat dinner at Fong Lye, you need to plan ahead and go early or else be prepared to wait and wait for a table especially during the weekends. 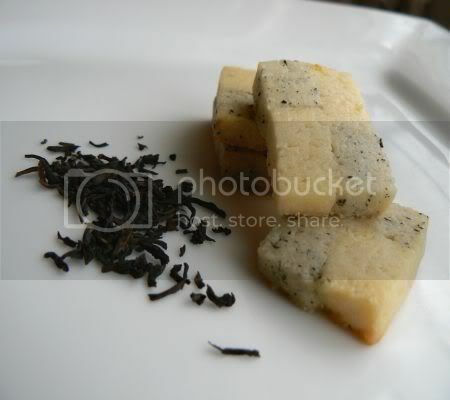 Start off your meal with fried beancurd cubes as an appetiser and their chinese tea served in blue and white teapots. 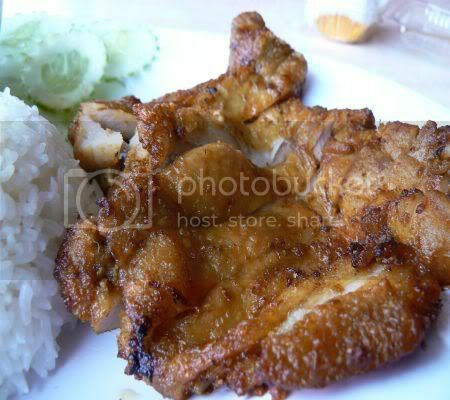 You can order dishes that can be taken with rice or porridge that comes with a piece of sweet potato. 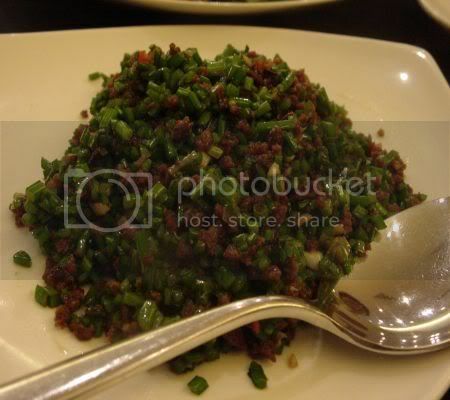 My absolute favourite ever since my friend introduced me to this is the minced chives with meat(RM13++). It has a funny name written in Chinese on the menu that refers to this as "mosquitoes" probably because the chives have been sliced so thinly. Very moreish especially with porridge. We were recommended this chicken with lots of spring onions, chillies and ginger shreds (RM18++) by the waitress. It was not too bad but I kinda prefer their 3 cup chicken dish that is so aromatic plus sticky with chinese wine, ginger slices and basil leaves stirred in. 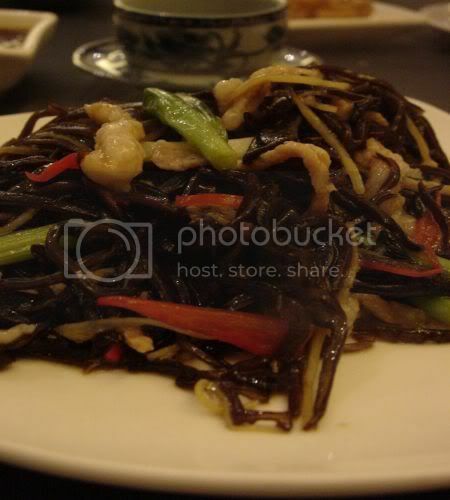 We also ordered the shredded black fungus and meat(RM20++) that was quite ordinary. The restaurant also serves "lion heads" which are huge meatballs cooked in vegetables that is pretty yummy. Another popular dish that gets sold out very quickly is their seafood pot that is kept warm on a portable grill on your table which can be shared among a few of you. We finished off the meal with romaine lettuce fried in anchovies and tiny olives(RM12++) that looked more like capers. Unlike other Taiwanese restaurants, Fong Lye does not serve any desserts but they do give you a complimentary lime juice in shot glasses which is to refresh your palate. Last Friday, we were hanging around Suria KLCC to catch the Da Vinci Code on screen. Since there was a new outlet at the Signatures Food Court (Level 2), we decided to give it a try. We wanted something quick before the movie started. Cafe Milano is actually a sister outlet of the ever popular Pizza Milano and they have now taken over Gelare's front lot. While Pizza Milano serves pasta and pizzas, Cafe Milano serves lasagne, shepherd pies, various meatball pasta, ice cream and waffles. I suspect they must have taken over Gelare's old waffle and ice cream equipment. I had their version of shepherd's pie - it's available in beef and chicken(RM8.50). A total misnomer since shepherd's pie means minced lamb but here it's used loosely as anything with a mashed potato topping. What is hilarious is their version starts off as a lasagna with the pasta sheets but ends up with a mash potato topping! The "pie" is not too bad but somehow the filling had an overdose of black pepper making it extremely peppery. 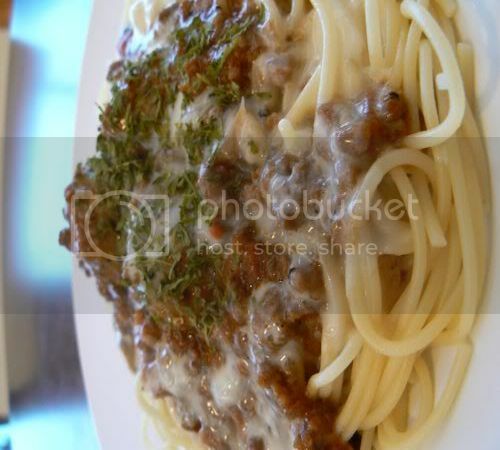 Splashie Boy had Meatball Bolognaise Spaghetti(RM7.99) i.e. three beef meatballs with pasta tossed in bolognaise sauce. Sauce is not too bad as it's the same as the Pizza Milano place but meatballs are definitely factory processed. 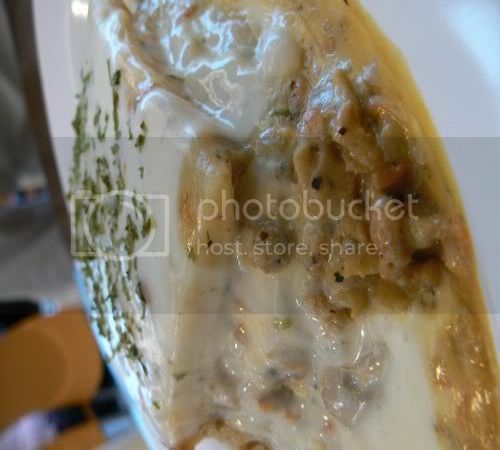 There are various meatball pastas with different toppings including one with Pizza Milano's famous Alfredo Sauce. We also ordered desserts - a nice and icy cold Red Rubies(RM3.80+) for me. I like the dessert stall as they have a huge variety of desserts. They also serve durian cendol if you are feeling adventurous. Quite a good choice especially if you're a tourist who is just in KL. The red rubies are actually pieces of water chesnuts encased in a red jelly substance. 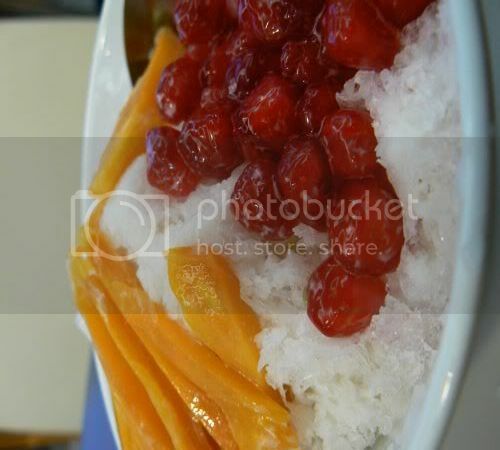 The yellow fruit is jackfruit which is all mixed up with the shredded ice and coconut milk. Splashie Boy had the leng chi kang(RM3.33+) which was really difficult to take a picture of since there was a light reflection. Whenever we order from this stall, these are the two must haves for us. There's not much happening at the food court but the sausage stall is no longer there and has been replaced by a Hong Kong noodle outlet called Eat & Talk. Will give that a try the next time I dine at Suria KLCC. What shall I eat afterwards? Fish? Or Fish? Or more fish? 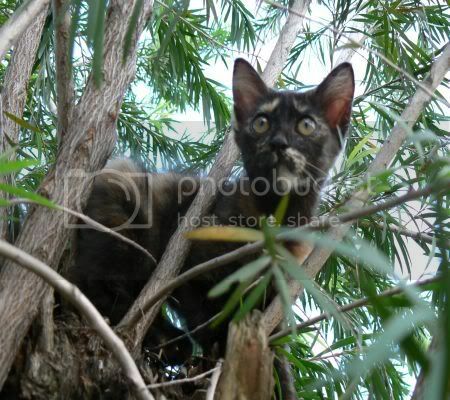 The kitties are always up the trees especially this old tree stump we have. 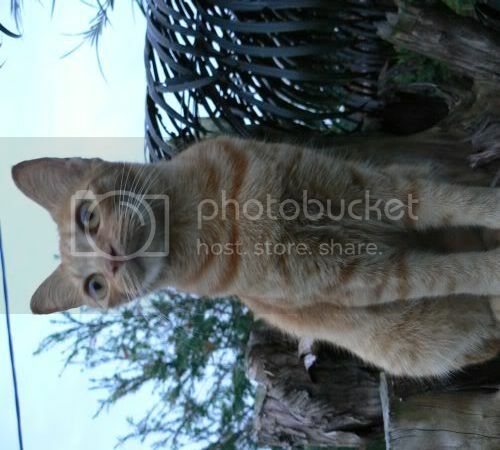 I managed to catch G the cat perched on top of it looking very serious about life. Sometimes she and the grey and white kitten will play catch on these stumps. The colours of the picture are slightly dull as I took it really late i.e. just before it turned dark today. Do head over to Clare's at eat stuff where you can see Kiri checking out his surprise visitor. More cake! Sorry to those who don't like sweet stuff but since I started my banana cupcakes, I was kinda on a roll hence I decided to make this cake. This time round, the cake is unique because it has no butter or oil plus it's almost flourless since only one tablespoon of self raising flour is added in. 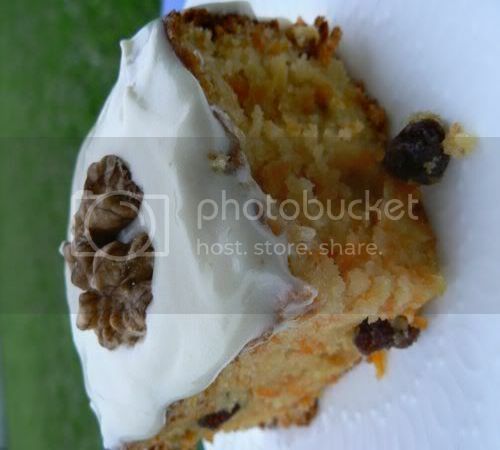 The texture is unlike the carrot cakes you see at the shops because it's lighter with the egg whites folded in, very nutty with all those ground almonds and the colour is pale versus the dark brown cakes since it does not use any brown sugar. 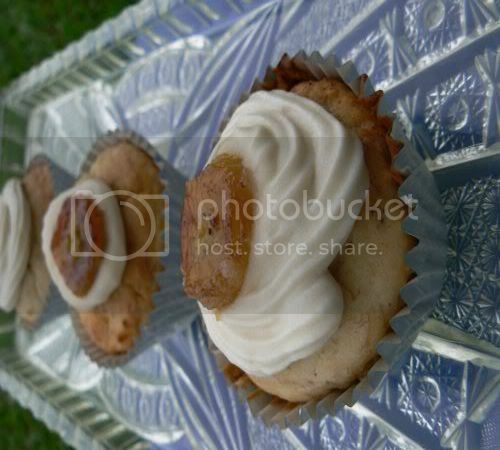 I topped it with the cream cheese frosting from the banana cupcakes which went well with the cake. It's advisable not to frost it as the cake is sufficiently moist enough to stand on it's own. However since I had the leftover frosting, waste not. The good thing I noticed about this cake is since it's moist, I can leave it in the fridge (to keep the frosting hard) and when you eat it cold, the cake is still perfect and not dry. If you try out the recipe, I suggest cutting down the quantity of sugar stated as I found it too sweet for my liking. Place egg yolks in a mixing bowl and combine with 200 grams of sugar. Whisk together until thick, light and lemon coloured. Have the egg whites ready in a bowl and whisk until foamy. Add the remaining 50 grams of sugar and continue whisking till it takes a slight glossy look. Gently fold in the lemon rind, grated carrots, ground almonds and raisins in the egg yolk mixture. When combined, carefully fold in the egg whites, followed by the flour. Today I managed to take a break in the afternoon hence I seized the opportunity to head over to the Palace of the Golden Horses to check out the Gourmand World Media Awards which started yesterday (17 May) and is due to finish on Sunday (21 May). Basically this is "the Academy Awards of the food and wine media" (as extracted from the Flavours magazine write up). It's also quite an honour for Malaysia to host it this year since it's the first time it has been held in Asia. The awards will be announced at the Gala Dinner held on Saturday night but in the meantime, there are lots of events for the delegates. I managed to catch one of the Masterclasses they were holding in the afternoon hosted by Chef Wan, Malaysia's celebrity chef. It was really fun as he was extremely entertaining (Sorry for the slight blurry pix as he was moving his hands). He demonstrated two dishes: Kerutup Daging (a beef rendang originating from Terengganu) and Lawar (Vegetable Kerabu). We sampled the food and it tasted really good. There are Masterclasses held throughout tomorrow and on Saturday with Le Cordon Bleu chefs, Florence Tan and Chef Shukri. 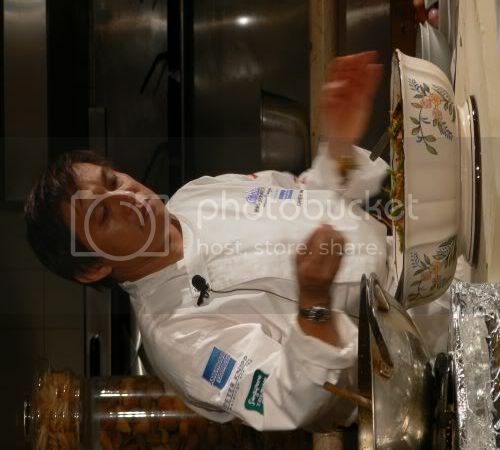 Sadly I missed Bob Blumer, that quirky guy from Surreal Gourmet as his Masterclass was held in the morning. As this is all about cookbooks, the nominated cookbooks are on display for everyone to view. Really fantastic nominees - even though I can't understand the language, I am blown away by the photography. A few of the publishers have also set up booth at the hotel whereby you can purchase certain cookbooks. I was eyeing The Silver Spoon, THE Italian cookbook that everyone is talking about which I have yet to see on the bookshelves here. If you love Italian, you should get this huge book which is going for RM150, a steal since it's usually priced at RM200. According to the distributors, they are not planning to bring it to the KL bookshops. The only problem with buying the books is they don't really have credit card facilities yet. One stall is due to get theirs tomorrow while another accepts Amex and cash only. At the top of my head, I saw Marshall Cavendish's books, Conran books (they have last year's winner, Harumi Kurihara's book), BBC Books which includes Delia Smith and Le Cordon Bleu books. If you are a food enthusiast and crazy about cookbooks, head there to check out the various cookbooks and Masterclasses. 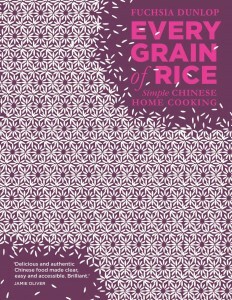 For further details, check out the awards website and the cookbookfair website. Once in a blue moon, I get the sudden urge to bake. Since we had a lot of leftover bananas lurking and getting riper by the minute, I decided to try out another banana cake recipe I have from a Her World cookbook. Unlike the first one I tried, this one is a lighter version with a softer crumb and is eggless. 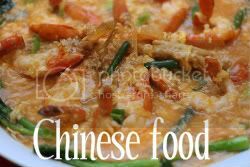 It's brilliant to have these kind of recipes that has no eggs as it's sometimes difficult for me to get fresh eggs unless I visit the market. Buying those eggs in cartons at the supermarket shelves just does not cut it as those eggs are usually not fresh. If you have vegetarian friends, you can also consider this recipe as their diet may restrict them from taking any eggs. Since the original recipe was for cupcakes, I decided to stick by it since it was my first time trying it out. Although the recipe is not as straight forward as the previous banana cake recipe which was a one bowl method, this one was pretty easy too. The batter that came out was quite sticky and thick since the only liquids it had was milk. I must say, the cake was brilliant as the crumb is flaky and so light. Only complaint I had was I didn't think the bananas I used were banana-ey enough as the flavours were not so intense. Either I have to add more bananas or use a different type of banana. The next time I make these I will definitely add chopped walnuts to give it extra oomph. I also decided to decorate my cupcakes, something I don't normally do because I thought having it plain and unadorned looked boring especially since I saw brilliant iced ones on Cupcake Bakeshop and Scent of Green Bananas. I used a cream cheese frosting I found on Cupcake Bakeshop but it was kinda soft hence it didn't turn out fantastic. Since I had no cute and teeny bananas like Santos, I topped it with a piece of caramelised banana. Tastewise, it was yummy but it defintely needs to chill in the fridge or else the topping will melt away in our heat. Mash bananas together with lime or lemon juice and set aside. This helps prevent the bananas from growing brown. Sift the flour, baking powder, bicarbonate of soda, salt and ground cinnamon together twice and set aside. Cream the butter until soft and add the sugar gradually. Continue beating until mixture is light and fluffy. Add the milk, a little at a time and beat well. Using a large metal spoon, fold in one third of flour, followed by half of the mashed banana, another one third of the flour, the other half of the mashed banana and finally the remaining flour. You can either bake the cake in a loaf sized tin or cupcakes. If baking in tin, bake at 180C until done. 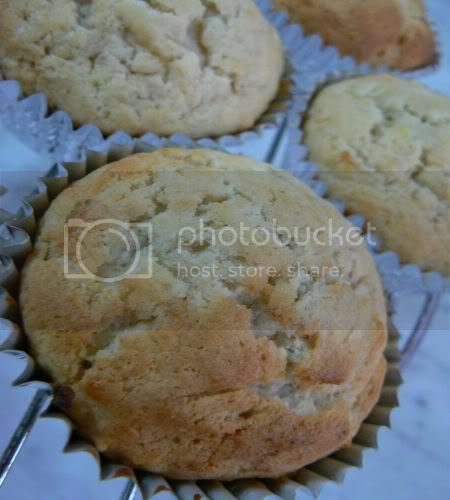 If using cupcakes, bake at 200C for 10 to 12 minutes. Since mine was a bigger size, I baked them for about 15 minutes. Leave the cake in the tin for 5 minutes before turning it out from it's pan. Last Saturday, I managed to persuade Splashie Boy to make a detour to Subang Jaya to try out the food at Asia Cafe for lunch. It was a breeze to get parking with the long weekend. We spied the pizza place when we did a quick tour around which Splashie Boy decided to order. Prices are extremely reasonable with regular pizzas ranging from RM15 to RM12 depending on which type you order. They also have calzones which they make funny shapes with. 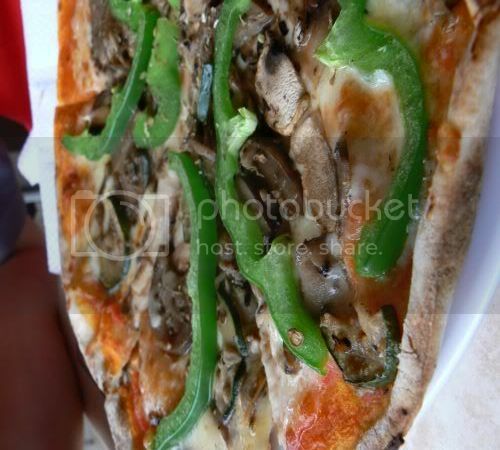 He ordered a vegetarian pizza(RM12) which came with an extremely nice and thin crust. Definitely a winner because of it's crispy crust but we didn't like the toppings they put on top as the combination of eggplant, mushrooms, zucchini and capsicum was a bit bland. I wanted something different and decided to try out the Vietnamese Lemongrass Barbeque Chicken(RM5.90) which was near where we sat. It's pretty okay as it was a change from the usual barbequed chicken you can get from the Chinese stalls. The other recommendations you all mentioned were not opened since it was lunchtime i.e. the fried mushrooms, crabs, grilled fish and etc. We ordered the huge fruit juices they have - a small mug comes up to RM4+. I decided to try out the Hong Kong dessert stall and ordered a honeydew mochi(RM3.90). Everything is pre-made and chilled. The mochi has a fresh honeydew ball inside it which was cold. 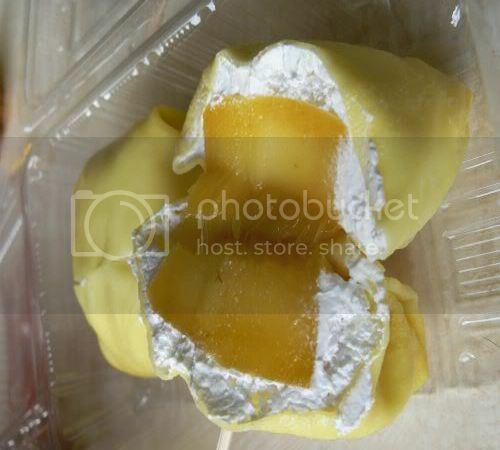 Also ordered the mango pancake(RM3.90) which from a distance looked like durians as the pancake was very yellow. It's filled with fresh whipped cream and a chunk of mango. It was not too bad but lacked much taste since it was chilled. Besides these they also have different kinds of mochi, durian pancake and soya bean curd with fruit toppings. I just read about this on Food Blog S'cool after I posted my food blog or else I would have left it out since it's no food blog day today. What's this all about? It seems the big Internet providers in the USA is lobbying the Congress to allow them to create a two tier Internet system where there will be a fast lane provided to those big guns who can pay and a slow lane for consumers. This means the loss of free and open Internet known as Network Neutrality. Although you say why be bothered because it's so far away in the USA, knowing how life works - if it is implemented in the USA, one day it will appear in Malaysia as most countries follow best practices from the overseas. I honestly do not want discrimination in my own backyard with regards to my Internet services which I pay for. I am already suffering slow service since we only get one major broadband provider so can you imagine how painful it is if they start restricting the Internet because they have a right to do so. What can you do to help? If you're a non USA resident, put this plea put in your blog or write about it so your USA resident readers can read about it and contact their Senator or Congressperson to voice their concerns. You can also sign the online petition at SavetheInternet.com to support Net neutrality and ask your readers to sign it. If you're a USA resident, contact your local Senator or representative by writing or contacting them to protest against this action. Read Food Blog S'cool for further details. Last Sunday, one of my distant aunts made these Hakka dumplings as a treat for us. Although my father's family is Hakka, it's my first time eating these savoury dumplings. 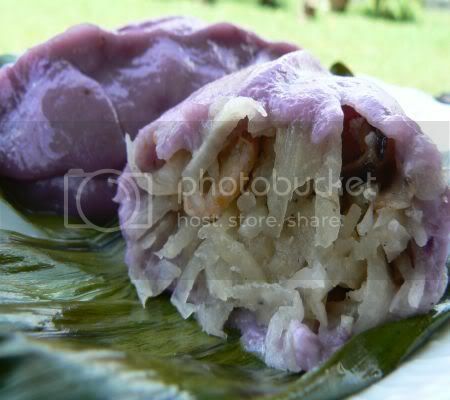 Usually the rice flour skin is white but she added sweet potato into the dough which gave it such a pretty purple colour. 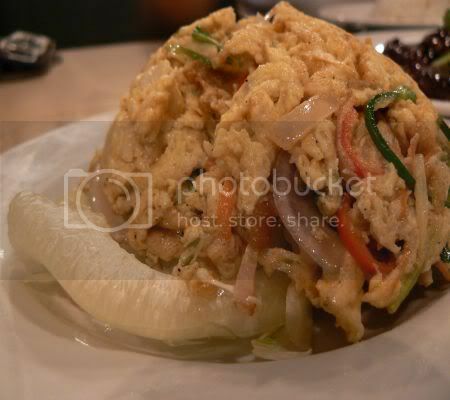 The dumpling is filled with shredded yam bean, dried prawns and Chinese mushroom. Really yummy stuff. If any one knows what's the name of this, do let me know. I did ask my aunties and they mentioned it's called Lor Mai Chi which is similar to the sweet type filled with coconut and ground peanuts. 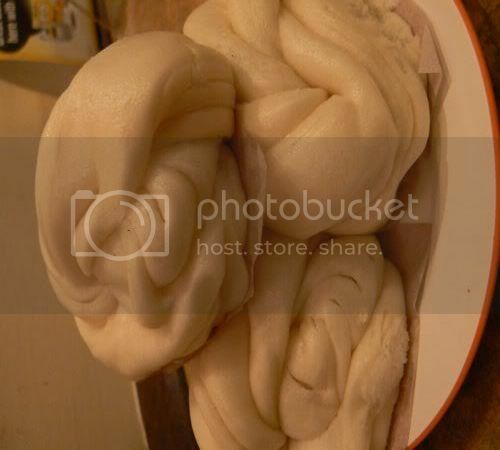 As the Zongzhi festival will be held soon, another aunt made her famous dumplings (bak chang) that was simply yummy. Didn't take any pictures of it but here's the link to last year's pictorial of making zhong (bak chang) by her. Remember to start ordering and eating them as the festival starts end of this month. Such hot crazy days - it looks like it will rain every afternoon but no such luck! Splashie Boy and I keep looking for things to cool off with. Yesterday after a hectic weekend of running around for a family event which took a lot of time and patience, we managed to get some time off and decided to indulge in a teabreak. We don't usually have tea hence this was Splashie Boy's first time at the dessert shop and my second time eating here ever since it opened in SS2. 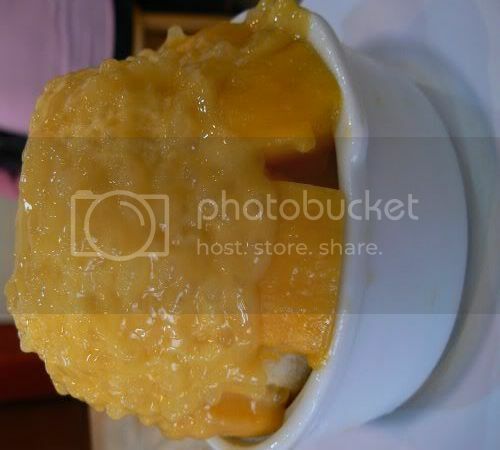 I had the Mango Loh(RM5.50+) which is essentially finely shredded ice topped with mango puree mixed with sago pearls and chunks of mangoes. I suspect they add syrup at the bottom before they top it with the ice as it was quite sweet when it's all mixed down. If you eat just the top layer with the mango puree on top, it's much nicer since it's less syrupy. Splashie Boy wanted the Kiwi Loh but I remember reading WanTan Productions which advised that their Kiwi Loh was sour as the kiwis they used were not that ripe so I steered him towards the Honeydew Loh(RM5.00+). 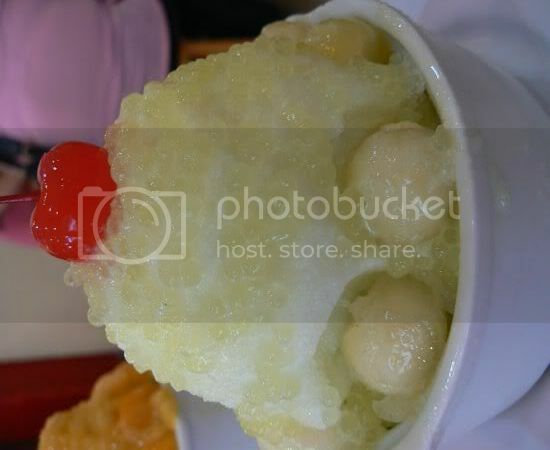 It's essentially the same as mine except his topping was honeydew puree and his sago pearls were green in colour. They also topped his dessert with a hot red maraschino cherry. Although they were sweet, it did the trick as we felt pretty refreshed (must be all that sugar content!) after that quick pit stop. The place was super packed with people trying to cram in their tiny shop to indulge in tong sui, fruit lohs and snacks. 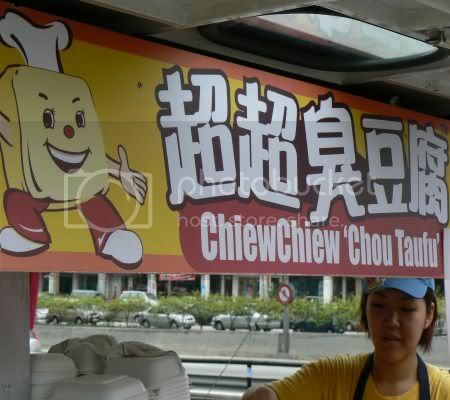 This particular outlet is a branch of KTZ dessert from Kepong which is famous for their peanut butter tong sui. How do I get down from here????? Fluff Puff is growing up - she's now under her big brother's influence and he's teaching her how to live life to the fullest as a kitty cat which means climbing trees. Sadly he only taught her how to get up but not down so I had to pluck her from the tree as she was scared stiff after she saw how high it was. Nowadays the weather is haywire - super hot during the day and then in the late afternoon, heavy rain that causes chaos everywhere. Whenever the weather is this crazy, I often reach out for some icy cold comfort in a form of Indian cendol - a steal at only RM1.20 a bowl. All throughout the city, you see these vans or stalls that sell cendol together with Indian Rojak. Some are more popular than others but this one in SS15, Subang Jaya seem to always have perpetual long queues. Long ago there were rumours flitting around that these cendol men have unusual ways to keep their cendol tasting special. One said it was a bag of earthworms inside the coconut milk while strong rumours said it was used sanitary pads. It was probably nasty rumours spread by competitors as I doubt they are true. I didn't catch any nice pictures of the Indian Rojak man and was kinda shy to take more pictures since I was not eating any. However, I did catch these men in a row enjoying their rojak and cendol break. You sit at the ledge of the road while eating your spicy Indian rojak. 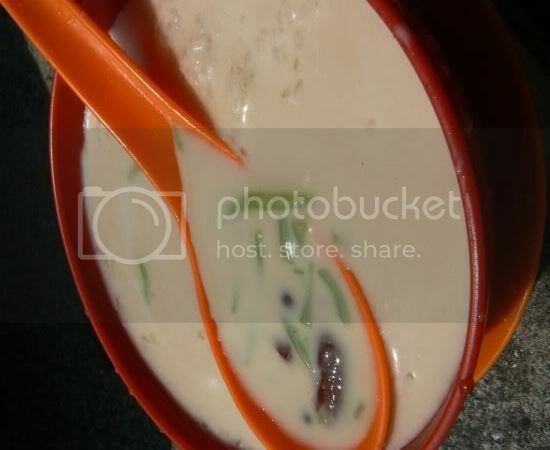 That gets your sinuses working which you'll cool down with a bowl of icy cold cendol. Whenever I get really fed up of eating solo, my hands start to itch to make something nice. Since there was half of a pumpkin lurking in the fridge, I decided to make pumpkin and tomato laksa from Nigel Slater's The Kitchen Diaries versus my usual standby of roast pumpkin. As usual, I had a hitch when trying out a recipe for the first time. My pumpkin cubes were slightly overcooked - I think I shouldn't have left them too long in the steamer since they were already quite soft as it had been in the fridge for quite some time. Overcooking the pumpkin caused it to merge with the broth making it thick and orangey but it didn't affect it's taste as it was still fantastic. 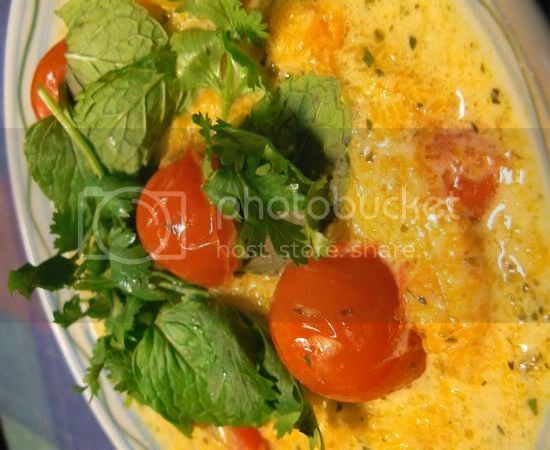 You can't see the noodles as they're underneath so at one glance you'll think this is roast pumpkin soup served with cherry tomatoes topped with a sprinkling of coriander and mint leaves! Cut the pumpkin into cubes and steam them. Watch the pumpkin closely as you don't want it overcooked like mine. The recipe says 12 to 15 minutes but since I used a local pumpkin which was sitting in the fridge for a while, I guess I should have steamed it for less. Make the spice paste by blitzing them in an electric blender the following: garlic cloves, kaffir lime leaves, coriander roots, coriander leaves and stems, fresh ginger, chilli padi (bird eye's chilli) and lemon grass. The spice paste can get quite mild so if you want lots of fire, add lots of chilli padi unseeded. If it's too thick, add a bit of oil to make the paste go round. Cook the noodles seperately in boiling hot water. I used thin rice noodles but what would be more ideal will be thin Thai laksa noodles. Heat up oil in a deep base pan and fry the spice paste to get rid of the raw taste. Add chicken stock and coconut milk to boil. Once boiled, add nam pla (fish sauce) and calamansi lime juice (Nigel uses lemon juice but I wanted it localised hence the use of calamansi lime juice instead) to taste. You can add more if you wish it to be more tangy. Add the halved cherry tomatoes to boil for about seven minutes. You can add the pumpkin cubes in for a minute once the tomatoes are cooked to heat it up. If your pumpkin cubes are soft like mine, don't add them into the pot but spoon them into the bowl when you are ready to serve. Place the cooked noodles in a bowl and add the laksa broth. Top with lots of coriander and mint leaves. If you want your laksa to be spicier, add chilli flakes. Enjoy with gusto accompanied with a great television show i.e. CSI. After hearing so much about the ginormous food court place in Subang Jaya called Asia Cafe, I finally managed to make it there. It's huge and so full of different stalls I had a very hard time choosing what to try. Eventually I decided to try these dumplings as I saw the Chinese couple making them. Although the menu and their picture shows it fried, I wanted mine with soup. It's a really good deal - I got 8 pieces for RM4 and they're huge. Extremely substantial enough for a meal and very delicious. I liked how my dumplings were just cooked right as I have eaten some overcooked ones before. They also give you a yummy chilli sauce made from dried chillies to go with it which was fantastic. The couple were making their dumplings - very sweet as the husband was rolling out the dough while the wife was filling it up before sealing it with the traditional folds. She was working really fast so it was kinda difficult to get a nice picture. 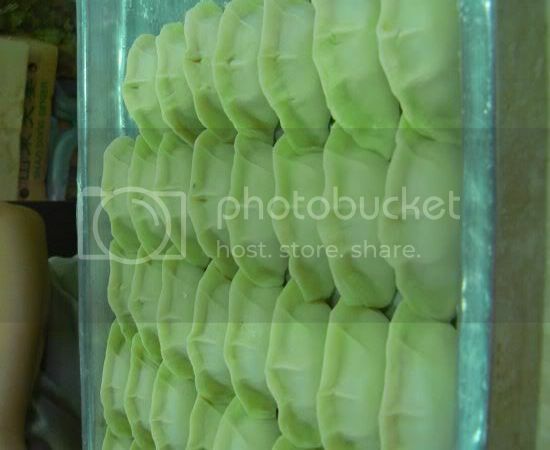 Here are the rows and rows of Guo Tie or dumplings which are ready to be cooked. I reckon the couple is from China as they only spoke Mandarin hence I had a bit of trouble ordering my food since I can only speak Cantonese. Will definitely come back and try their noodles as I wonder if it's hand pulled plus I must bring someone who can speak Mandarin. Too bad they don't make jiaozi which I love to bits. Any other recommendations for "makan" at Asia Cafe? Everything looks good that I was confused on what to try out. Just followed my instincts on this one and it turned out pretty good. Last Sunday after an exhausting Saturday we decided to take it easy. Since we had an errand to run down town, we ended up in KLCC. Our original plan for the day was to search for furniture for the house so we decided since we're in the area, we'll take a detour to Plaza Ampang City. Splashie Boy had a crazy idea to walk all the way from KLCC there so we took a morning stroll there. Luckily it was a nice cloudy day or else you'll hear loud protests from me. The place is really deserted and the only nice place was Xtra Living selling branded stuff like Ghost chairs, Herman Miller office chairs (drool! drool! ), Alessi, Kartell and etc. We did find a fantastic cookshop next to it called Pavillion which we plan to go back and spend lots of money on. A quick walk at the bridge between Plaza Ampang City to Ampang Park got us exploring the place. Original plan was to head towards the Bagel Station at Avenue K but since we were at Ampang Park, we decided to check out the place. We found this Cozy Corner place which I remember someone telling me it's famous. 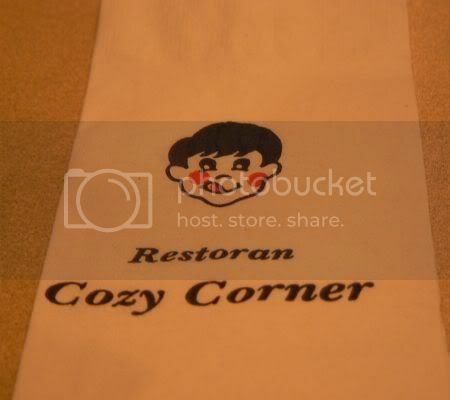 At first we were confused since we found Cozy House and then Cozy Corner at the same row. I thought they were the same owners and they had a branch at Great Eastern Mall until a quick chat with one of the captains revealed that they are not related at all! It seems Cozy Corner has been in business for a grand old 33 years (I guess since Ampang Park opened) and they have a genuine branch which just opened at Putrajaya Alamanda. We had to take a picture of their cute logo of the boy licking his lips. Incidentally Cozy House has the exact logo so I guess imitation is the greatest form of flattery. The place is quite dark and has black and white lines on their walls that kinda remind me of the colonial British houses. Splashie Boy was busy testing the camera in the low light conditions and although it protested a few times when the light was quite low, he did manage to get some good shots. 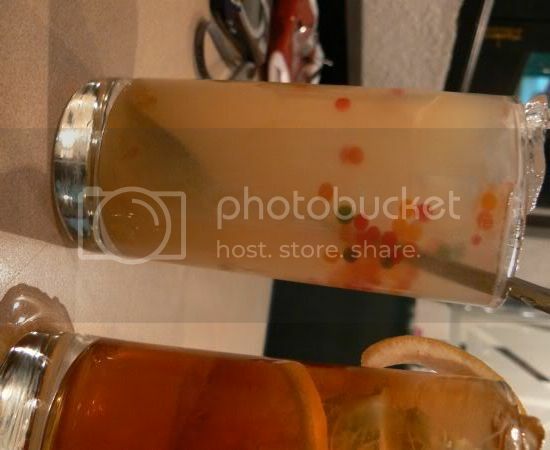 Picture of our drinks, they had this citron lemon(RM5.50++) which came with these adorable coloured round little jellies. Tasted pretty good too - much better than my boring ice lemon tea(RM3++). This place serves Western and Chinese food. We decided to eat rice with a few dishes. 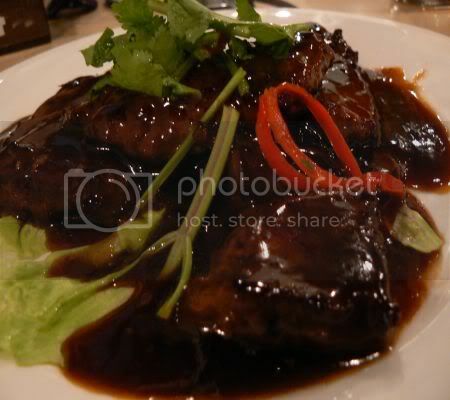 I wanted to order this straight away when I saw it on the menu - their beef with Chinese sauce (RM16++). Fantastic stuff as they had pounded the beef till it was nice and tender. Sauce was also yummy which went so well with rice. 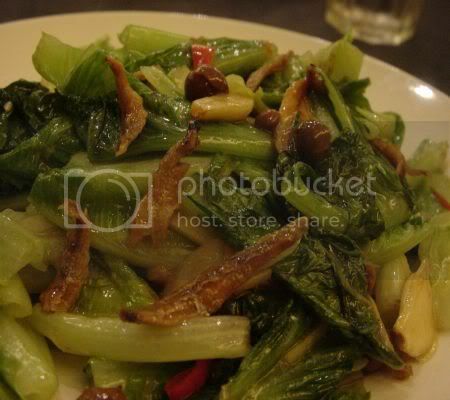 We also ordered Kailan with Oyster Sauce(RM9++) which was blanched kailan with a not too salty oyster sauce topping. Splashie Boy wanted the Egg Fuyong(RM8++) which we ordered. We thought it was so so and it I am not mistaken the menu said crab meat which is devoid in our portion. Tasted just like scrambled eggs. The place was packed during lunchtime with families having their Sunday lunch. Saw lots of people ordering the Western meals so we may give that a try the next time we come. It's actually a hop and a skip away from KLCC vide the train if you are bored with the food around the area. On the walk back, we spied a film crew in front of Avenue K - think they were shooting a hair commerical as they had the model/actress stand still with her hair at one side, ready for a flip hair shot. No pictures taken as they all looked really threatening with their security detail.